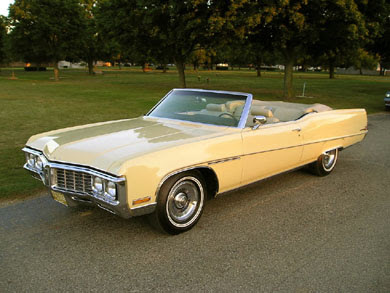 Speaking of Buick Electras, this is the two-door convertible version of my first car, courtesy of my Grandma McFarlane. It's a fantastic Flint ride from a time when aerodynamics and gas mileage took a backseat to style. The paint color? Bamboo Cream. Sounds like a drink that would give you a bad hangover. And I guess this car is emblematic of bad times for GM. The lovable land yacht was rolling off the line when the energy crisis hit in the seventies. But at least GM learned their lesson and didn't repeat the mistake of making huge vehicles in an era of rising fuel prices. Oh, wait, strike that last sentence.